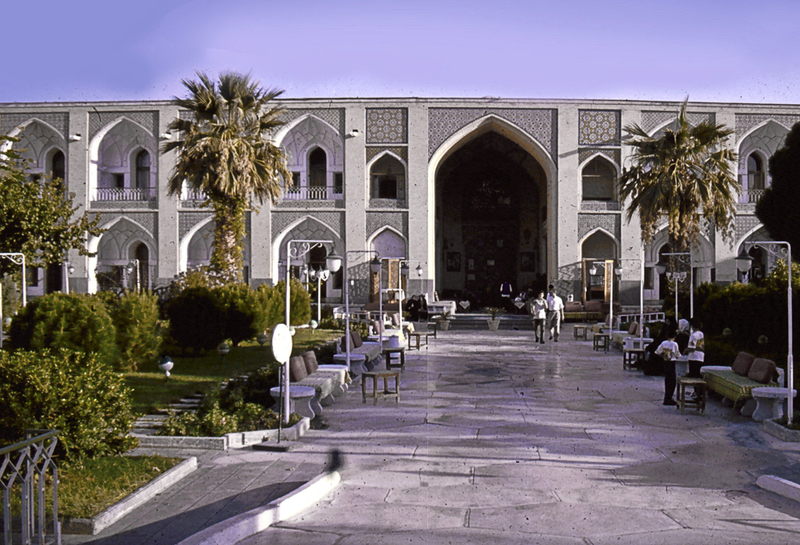 A sumptuous garden in the courtyard of a former caravanserai, now converted into a luxury hotel. The garden follows the traditional Persian chahar bagh design. 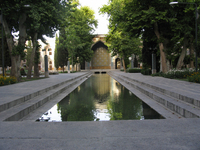 One axis of the chahar bagh is a broad, blue-tiled rill, which is lined along each bank with many high, slender fountain jets, angled to form a high arch of fine spray which rains down over the rill. The sight and sound of this water raining on the rill is memorable. 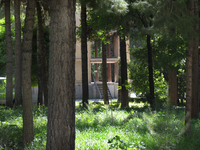 The other axis of the chahar bagh is a path which crosses the rill by a bridge. These axes divide the garden into four quadrants. In each quadrant is a pool in a complex geometric shape and four small octagonal pools at its corners. Thus there are 20 pools in the garden altogether. Each pool holds a small fountain. 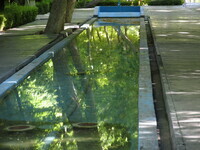 The immediate vicinity of each set of pools is paved. Elsewhere there are flowerbeds many marigolds - and lawns and many low, mop-headed trees and a few tall pines and palm trees. This planting is not historically authentic, but it is attractive. The garden is lit at night.